Ever since Chinese New Year in January this year, I have had my cycling gears and tool all packed up into a nice portable basket. During the New Year holidays, we had to go to Ipoh. 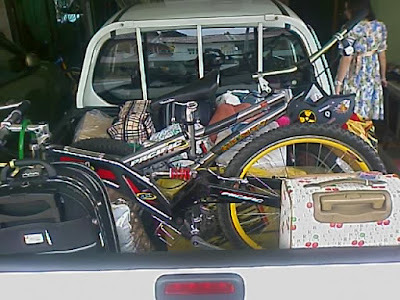 I was not going to spend the holidays in Ipoh without my trial bike... and so I packed everything I needed, bike and all... LOL. From spare tubes to alan keys, I packed everything I needed into a nice portable basket. Except for the helmet, all the gears and tools packed up in a tidy and neat basket. The basket was actually the container for the mandarin oranges bought from Giant supermarket.